"Rebellions are built on hope." That's a great quote from Felicity Jones in Rogue One: A Star Wars Story, an excellent spinoff of the Star Wars saga. 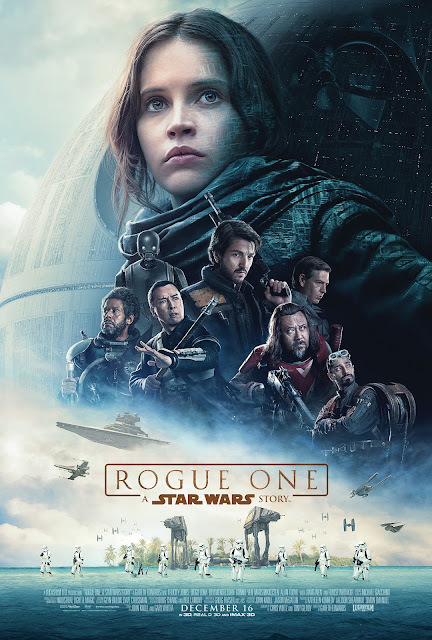 Jones plays Jyn Erso, whose mother was killed when she was a child, & her father, Galen Erso (played by Mads Mikkelsen), was taken away by Imperial weapons developer Orson Krennic (played by Ben Mendelsohn) to work on the Death Star, leaving her to be raised by Rebel extremist Saw Gerrera (played by Forest Whitaker). Fifteen years later, Jyn is released from Imperial captivity by the Rebels, who want her to track down Galen, telling her they will extract him; however, they secretly plan to kill him in order to stop the Death Star's completion. Jyn, Cassian Andor (played by Diego Luna), & K-2SO (played by Alan Tudyk) travel to Jedha, where the Empire is mining crystals to power the Death Star. On Jedha, they find Gerrera, who shows Jyn a hologram from Galen, who tells Jyn that he has secretly made a flaw in the Death Star's construction, allowing it to be destroyed. He says that the blueprints for the Death Star on the planet Scarif. Jyn, along with Cassian, K-2SO, Chirrut Îmwe (played by Donnie Yen), Bodhi Rook (played by Riz Ahmed), & Baze Malbus (played by Jiang Wen), devise a plan to steal the Death Star's blueprints to give to the Rebellion to stop the Empire, but the Empire will stop at nothing to stop them. The cast is excellent, especially Jones. Gareth Edwards's direction is excellent. Chris Weitz & Tony Gilroy's screenplay is great. The editing by John Gilroy, Colin Goudie & Jabez Olsen is amazing. The cinematography by Greig Fraser is amazing. The score by Michael Giacchino is absolutely brilliant. And the visual effects are nothing short of astounding. This is one of the best films in the Star Wars franchise.